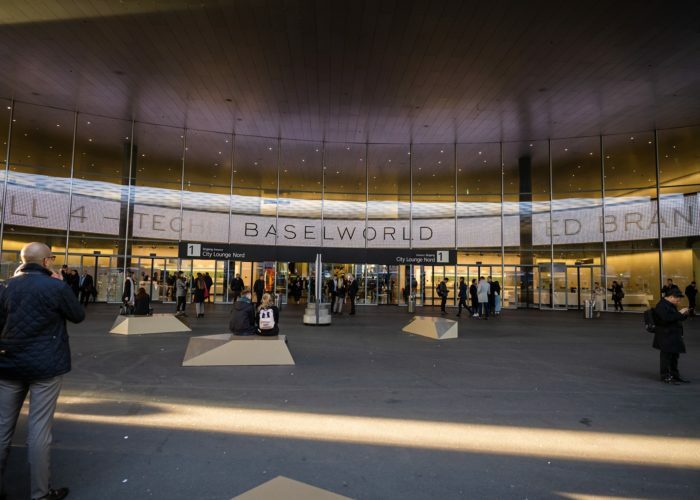 Japanese streetwear juggernaut, A Bathing Ape, has teamed up with the Swiss, aeronautical-themed watch company Bell & Ross. Continuing their 25th anniversary celebration, BAPE has been partnering up with many notable brands to produce limited edition, high quality products to commemorate it’s longevity in the streetwear community. By turning to specific heavy hitters like Swarovski, G-Shock, & Montblanc, it is no surprise that the streetwear label looked to Bell & Ross to create something memorable and timeless. Bell & Ross, a company that has been creating timepieces since 1992, prides themselves on durable and sustainable wrist wear. With its inspiration coming from the look of square gauges found on a fighter jet’s dashboard, each piece is made to suit those with extreme professions (or hobbies, at the very least). Despite its functions as a tool watch, Bell & Ross still deliver stylish products, providing subtle versatility. 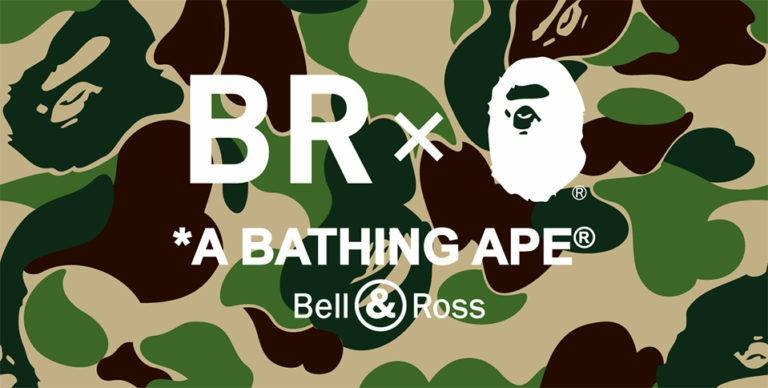 Especially with the backing of Swiss production, a collaboration between Bell & Ross and BAPE only speaks to both brand’s stance on making products with longevity. The collaboration is done on Bell & Ross’s BR-01, one of the brand’s most recognizable pieces. BAPE has added their own touch to the watch, delivering two different styles. The first is limited to 100 pieces. The dial is decked out in BAPE’s ubiquitous ABC Camo print, being a great contrast to the BR-01’s 42mm stainless steel signature square case. 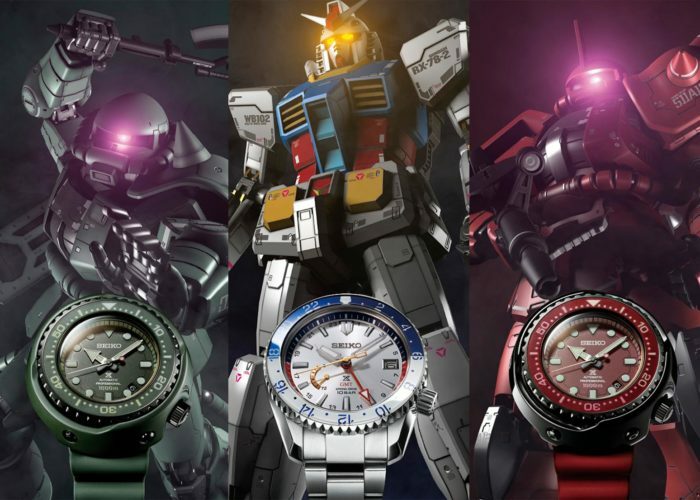 Flipping over the watch, you are hit with BAPE’s familiar Apehead donning both of the brands names, each etched on the caseback. Another feature of the watch is on the strap, where another Apehead with the quote “Apes Stronger Together” is embossed. 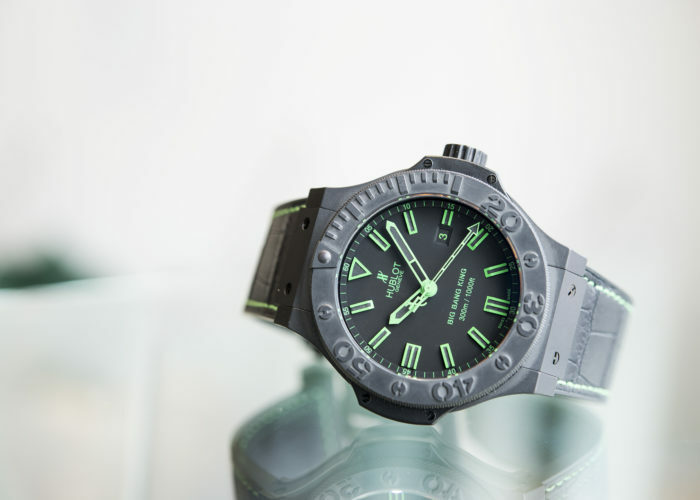 The watch is presented in a green camouflage-printed Pelican box, paying homage to Bell & Ross’s military background. The second is fully dressed in a black dial with hits of ultra-phosphorescent white hands and numbers. With only 25 pieces releasing, this black version is a nice minimalistic contrast to its green counterpart. The black rubber straps can be replaced with an additional black leather BAPE ABC Camo strap that also comes with the watch. An Apehead can be seen on the caseback of the watch, in similar fashion to its green version. This watch is also presented in a Pelican box with black camouflage print. These coveted pieces from the two brands are only available in-store at BAPE’s New York and Los Angeles locations. 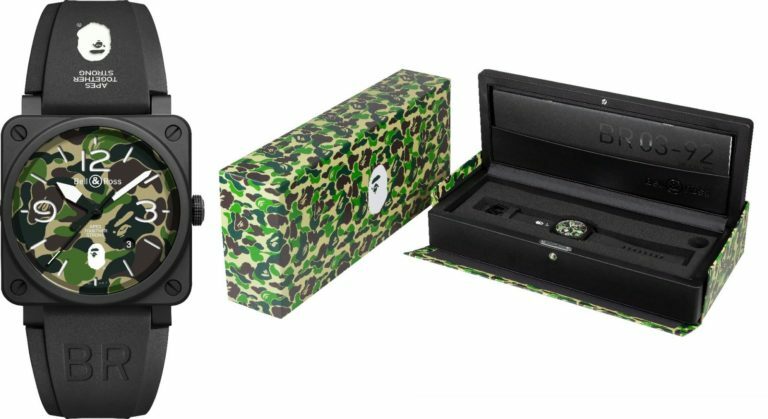 At $3,900 for the classic green watch and $4,400 for the more limited black piece, the BAPE x Bell & Ross collaboration has presented a luxurious timepiece that will please both streetwear and watch enthusiasts. Keep it locked on StockX to browse our various collection of watches, including more from Bell & Ross.